Erineum mite galls are visible on the leaf (center) in early spring. Erineum mite galls can have a pink or reddish coloration on young shoot and leaf tissues in early spring. Erineum mite galls visible on leaf surfaces late in the growing season. Back side of leaf infested with erineum mites. Notice that the galls have a fuzzy brown appearance on the underside. Underside of leaf infested with erineum mites. The galls appear fuzzy white to tan in color. Pest description and crop damage This mite is similar in morphology to bud mite. It is microscopic, wormlike, and white-yellow in color. 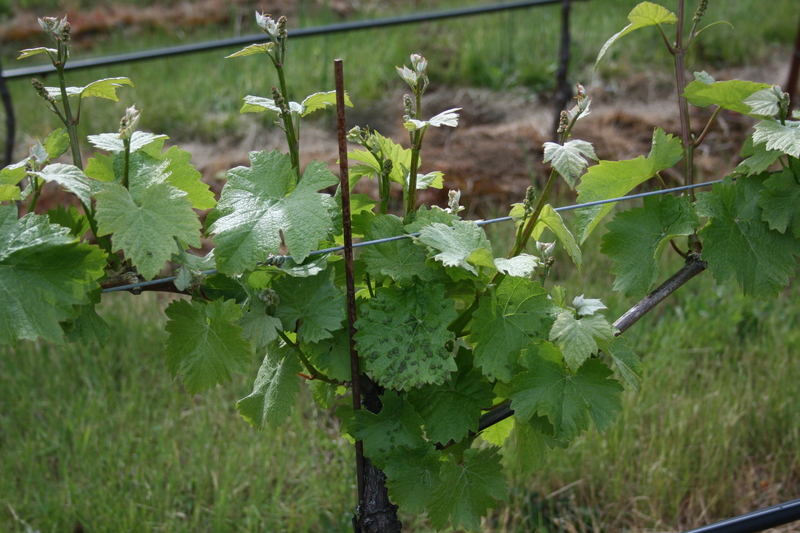 It overwinters between outer bud scales and bud tissue and feeds on leaves during spring and summer. The upper leaf surface becomes blistered, and the lower leaf surface of the blister appears hairy and white, almost resembling fungal growth. The lower leaf surface turns from a white color early in the season and progresses to yellow or brown later in the season. 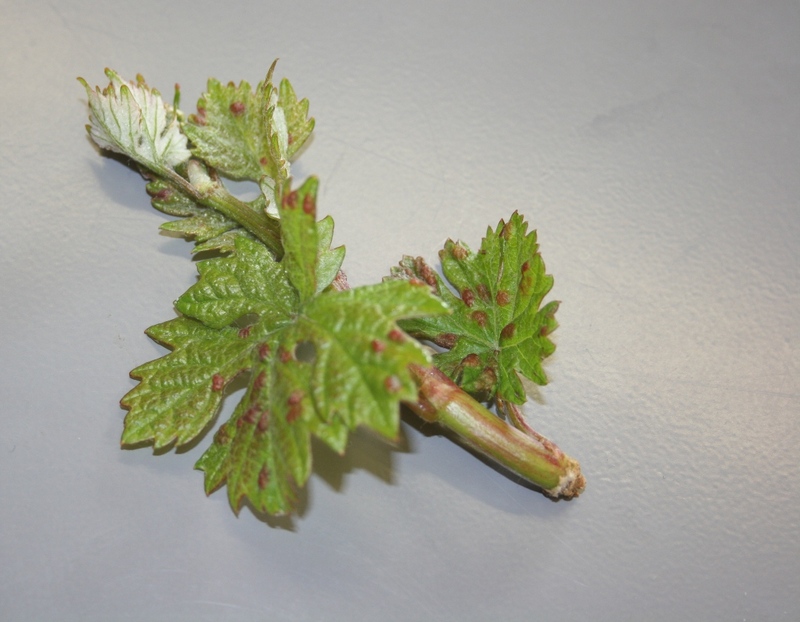 In severe cases, these mites may infest clusters in early spring. 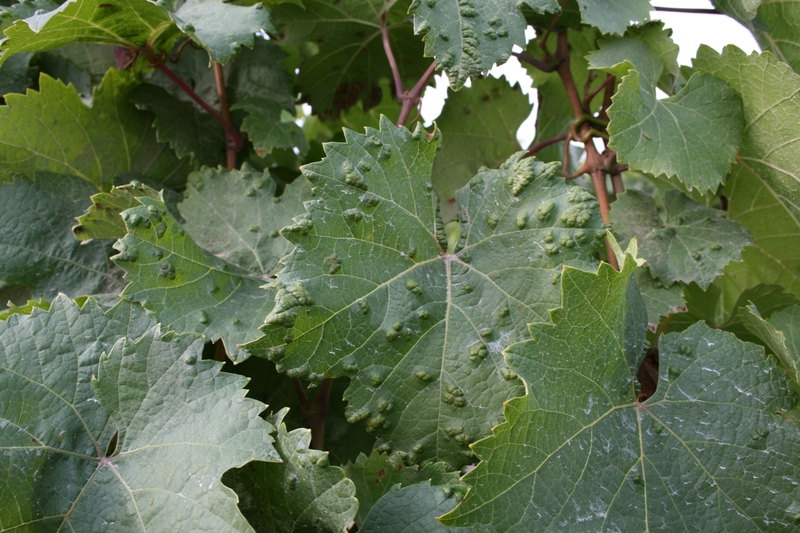 Grapevine Pinot Gris virus (GPGV) is known to be vectored by this mite. Biology and life history During summer, colonies of erineum mites live in blisters (erinea) formed by their feeding on lower leaf surfaces. The blisters are comprised of masses of enlarged leaf hairs. These blisters protect mites from natural enemies and direct contact of pesticide sprays. As the population increases, some move to new areas or other leaves and form new erinea. From mid-August until leaf drop, there is a movement from the erinea back to overwintering sites beneath the bud scales. Sampling and thresholds It is common for erineum mites to be found sporadically throughout western Oregon vineyards in any given year. 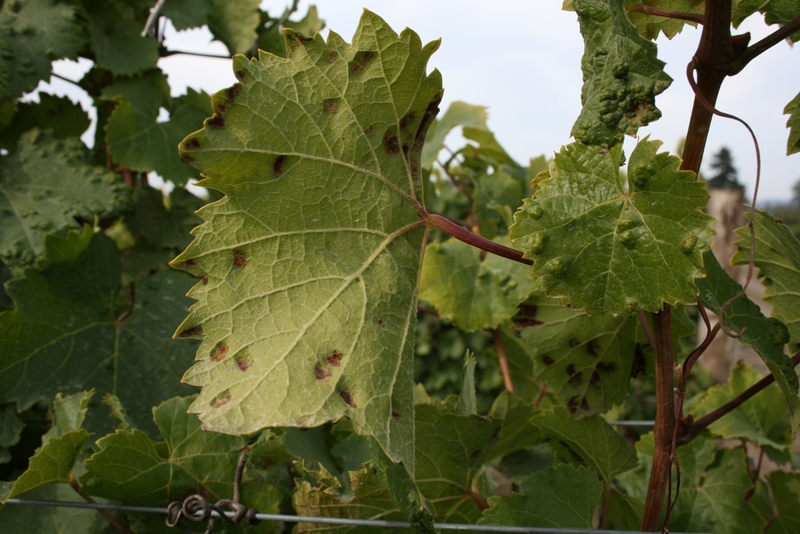 In recent years, there has been an increase in erineum mite presence in vineyards where there has been reduced sulfur use. However, this rarely leads to economic problems or crop losses. Currently, there are no damage or management thresholds. Predatory mites and beetles are important biological control agents of these mites. Dormant-season oils and insecticides used for other pests and sulfur applications for powdery mildew usually control this pest. Directed controls specifically for erineum mite usually are not necessary. Dormant-season oils and insecticides used for other pests usually control this pest. 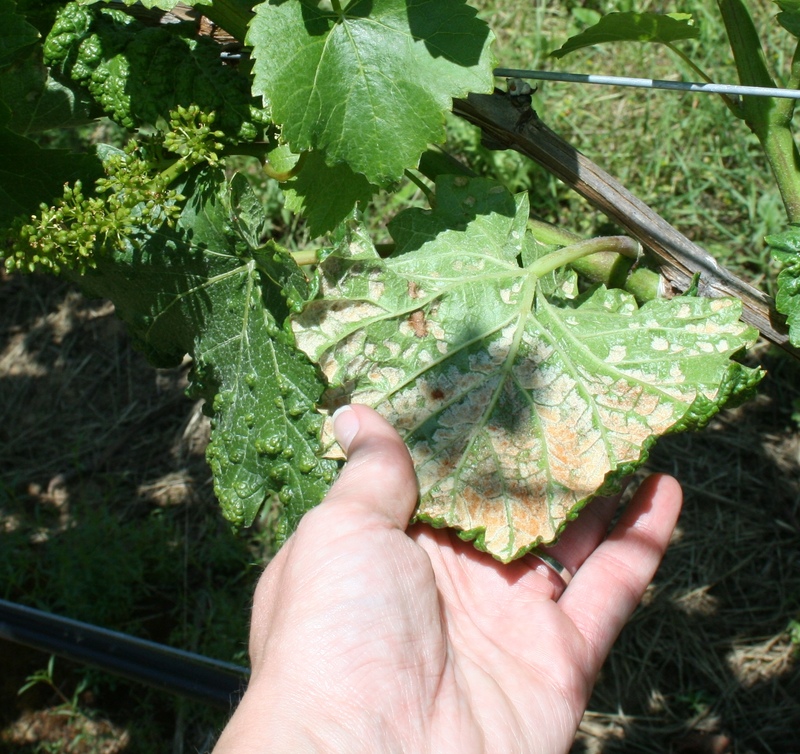 Also, sulfur applications for grape powdery mildew usually keep mite populations under control. Wettable sulfur is more effective than flowable sulfur formulations. Chemical controls are usually ineffective due to mite protection within galls. spirodiclofen (Envidor 2SC) at 0.25 to 0.53 lb ai/a. PHI 14 days. Use at least 50 gal/a spray volume. Do not use more than once a season, and do not exceed 0.53 lb ai/a per season. Group 23 acaricide. spirotetramat (Movento) at 0.10 to 0.13 lb ai/a. PHI 7 days. Ensure that there is adequate foliage for absorption of the compound. Allow 30 days between applications. Do not exceed 0.2 lb ai/a per season. Use a high quality spreader to enhance penetration into foliage; see label for more details on which adjuvants to use or avoid. Group 23 insecticide. Use recommended only when significant infestation may be affecting crop productivity.